Overall, Stella & Chewys Duck Duck Goose Freeze-Dried Dinner is a significantly above average cat food, earning 8 out of a possible 10 paws based on its nutritional analysis and ingredient list. 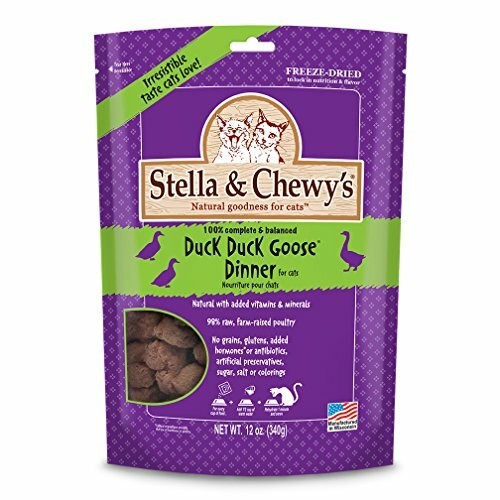 In this case, Stella & Chewys Duck Duck Goose Freeze-Dried Dinner's most plentiful ingredient listed is duck, which is considered a quality protein source. It also contains turkey, turkey liver and turkey gizzard as additional quality protein sources. Using the calculations provided by the AAFCO, Stella & Chewys Duck Duck Goose Freeze-Dried Dinner has approximately 476 calories per 100g (134 calories/ounce), which is considerably more calories compared to the average of the other dry cat foods in the CatFoodDB.